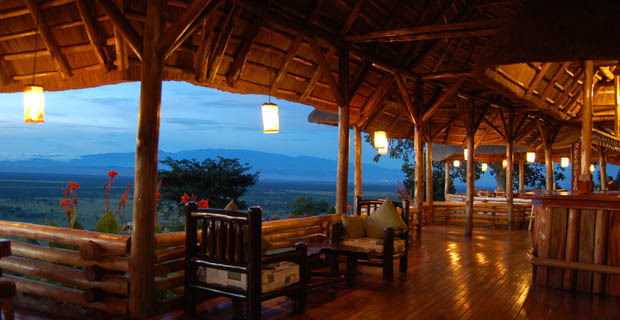 Katara Lodge is situated on the Great Rift Valley escarpment with uninterrupted views of the savannah, Lake Edward and the Virunga and Rwenzori mountain ranges beyond. Katara Lodge offers accommodation in eight luxurious thatched cottages, hand-crafted using local materials and carved into the hillside by the Katara village community. 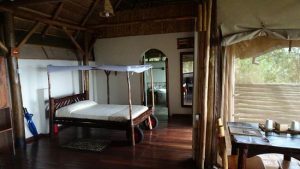 The cottages combine wooden floors, grass thatched roofs and canvas which can be folded away to reveal uninterrupted views of Queen Elizabeth National Park stretching out below. Cottage bathrooms are luxuriously fitted with a romantic roll top bath or invigorating rain shower, with heated water supplied using solar thermal energy. Guests will enjoy the beautiful views from the main lounge and relax and swim in the inviting outdoor pool.